At this time of year salad burnet (Sanguisorba minor) is thriving in the garden. It is a useful small salad herb that although not well known or often used today, was highly regarded by many early herbalists and housewives. One writer suggested that “the leaves stripped into wine and droken, doth comfort and rejoice thee hart and are good against the trembling and the shaking of the same”, while another claimed that it was “a capital wound herb for all sorts of wounds both inward and outward”. King Chaba of Hungary was supposed to have cured the wounds of 15,000 of his soldiers by the application of the juice of burnet. Thought to have originated in the Mediterranean, salad burnet is now naturalised over much of southern England and in parts of the USA although it is only seen in gardens in Australia. It is a perennial that grows in an attractive fountain-shaped clump. This growth habit makes it a perfect candidate for a border to edge a flower or vegie bed, it also looks attractive when grown in groups of three of more to form a larger dense clump. Gardeners in Tudor times used it to edge knot gardens and Francis Bacon recommended that it should be grown along pathways with wild thyme and water mint “to perfume the air most delightfully, being trodden on and crushed”. Dainty decorative soft green leaves. The dainty, decorative soft green leaves are found in pairs along wiry, reddish stems and the tiny red flowers occur in globular green flower heads on the ends of other stems. The whole plant reaches a height of about 40cm before it flowers, while the flower heads can be as tall as 75cm. Flowers are wind pollinated, and self-sow readily in the right conditions. Sow seeds in spring or autumn, either in a seed punnet or where they are to grow, and transplant or thin them out when they are a few centimetres high. Older plants don’t transplant well as they develop a strong tap root, but big clumps can be dug and divided into smaller ones, some of which will survive. 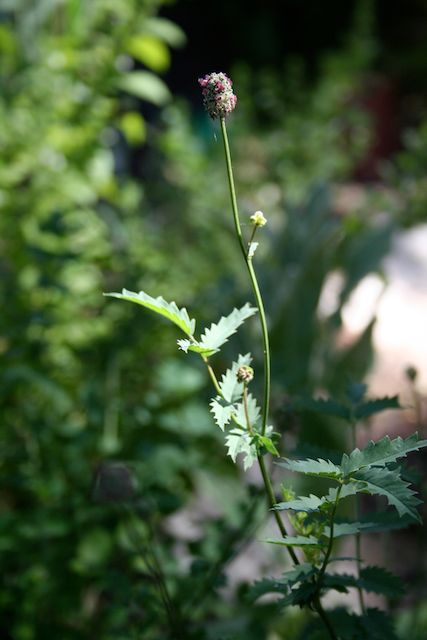 Salad burnet prefers a soil that is not too rich with a little lime added. It will do better in a sunny position but will tolerate some shade and needs plenty of water in hot weather for the leaves to stay succulent. If you don’t use the leaves regularly then cut back the whole plant from time to time to encourage tender new growth. 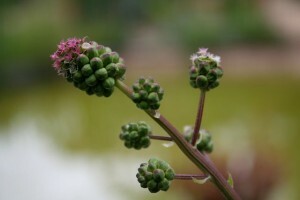 As its name suggests, salad burnet is primarily a salad herb. The leaves have a subtle, cucumbery taste which is both cooling and pleasant. When the plant is young, whole leaf stems are picked and chopped with scissors into salads, sandwiches, soups and dips. As the plants age, the stems become more wiry, so strip the leaves from the stems before you use them. Add salad burnet at the beginning of cooking to asparagus, bean, celery and mushroom soups to give them a slightly different taste. The flavour is mild so large amounts can be used without overwhelming other flavours. A handful of finely chopped burnet leaves combined with cream cheese, pepper, salt and thinned with a little cream, makes a delicious dip. Alternatively you can chop leaves directly into any green salad, or add whole sprigs to iced drinks or claret. Try filling a jar with salad burnet leaves and covering with a good white wine vinegar. Seal and stand on a sunny windowsill. Strain after a few weeks and use this aromatic vinegar to make salad dressings (some of the finest French dressings are flavoured with burnet) or as part of a marinade. 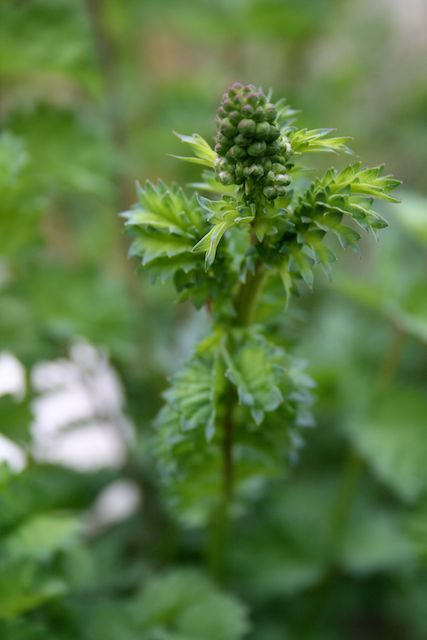 Finally, if you are prone to over imbibe from time to time try pouring boiling water over a handful of salad burnet leaves, leave to cool, strain out the leaves and drink the liquid “as a cure for, or an alleviant of, drunkard’s thirst”. This dressing is delicious with many different salads, particularly those based on lettuce or beans, and it will keep in the refrigerator for months. Combine all the ingredients in a bottle or jar and seal. Shake well before using and if possible make this at least a day before you want to use it to allow the flavours to mature. That salad burnet is a really pretty plant. I’ve never tasted it – well, not to my knowledge – but this article reminded me that it’s only in recent years I’ve begun to understand how beautifully “ornamental” most culinary and medicinal herbs can be. Yesterday I went for an all-too-rare walk in my neighbourhood and found a new delight. One house has taken a lot of trouble OUTSIDE the front fence, where it can be seen properly, to design a strip garden dominated by tall comfrey in groups, giving a very pleasing architectural effect. I always carry a plastic bag and a pair of secateurs when I go for a walk. I end up talking to so many interesting people and now I have a plant to remember each of them.